According to NAFTA, the top three busiest cruise ports in the world are all in southeast Florida. The busy Port of Miami leads the way, handling almost 5 million cruise passengers a year. No wonder it is nicknamed the “Cruise Capital of the World”! Most cruise passengers require parking for their vehicle so we’re here to provide a range of cruise parking options near the Port of Miami, including comparative costs, distances and helpful tips. Port of Miami currently has 8 passenger terminals serving 22 cruise lines berthing 55 ships, and this number increases every year. Popular destinations include the Caribbean (east, west and south routes), Bahamas, and Mexico, West Coast USA, Alaska and South America via the Panama Canal. Miami Port is located on Dodge Island, south of Biscayne Bay and Miami Beach and east of Downtown Miami. It is connected to the city via a causeway over the Intracoastal Waterway, and via the undersea Port of Miami Tunnel to the nearby MacArthur Causeway on Watson Island. The port developed historically to handle containerized cargo between the Americas. With the relatively recent expansion into cruising, the port has no capacity for cruise passenger parking, hence the need for off-site car parks in the surrounding area. As you can imagine, the logistics of efficiently handling millions of passengers arriving and departing from this island-port in Miami are considerable. As with most services, cruise parking prices vary depending upon the convenience to the port and the parking services included. The closer you are to the Port of Miami, generally the higher the parking rate. If you park at one of the coveted terminal car parks actually in Miami port, you will pay for the convenience. These cruise parking slots also need to be booked well in advance. Make sure you have the best cruise luggage tags, get them from here. You will generally pay a lower rate if you choose cruise parking in Miami that is further from the port. You will pay more if the parking is on-site, covered, or if you have an oversize vehicle. You should expect to pay at least $35 for 7 nights cruise parking, and up to $300 in certain cases. If you are planning to spend the night before departing on a cruise out of Miami, you can get low cost (or even free) cruise parking from a Miami hotel. Stay and Cruise packages usually include a courtesy shuttle service to and from Miami cruise port. To give you some idea of comparative costs of Miami cruise parking lots, these rates provide a guideline cost per day. NB. Many shuttles are free for up to 4 passengers and their luggage. Extra passengers may be charged each way for the transfer. If money is no object, the best cruise parking at the Port of Miami is actually onsite. It is convenient to the ships, has high security and is offered in a covered parking garage or on a secure uncovered parking lot. There is a free shuttle to transport you and your luggage to the cruise terminal which takes a couple of minutes. These sought-after cruise parking lots need to be booked well in advance. Generally, you must pay on arrival at the Port of Miami car park. Charges are calculated per night at $22, so allow $154 for a 7-night cruise and $308 for 14 nights. There are surcharges for oversize vehicles including vans, RVs and vehicles over 20 feet in length (at an additional $22 per day). Passengers with limited mobility will find the terminal cruise car parking at the port of Miami is the easiest and most convenient. Designated parking spaces are available for those with a disabled permit or license tag. Standard cruise car parking rates apply; however, there are some exceptions. Vehicles with specialized equipment or displaying a State of Florida license plate for disabled veterans many park free. Check out the official Miami-Dade website for the latest information about disabled parking at the Port of Miami Cruise Terminal. Alternatively, disabled drivers can use one of the off-site or hotel cruise car parking options in Miami and get a taxi to the port. 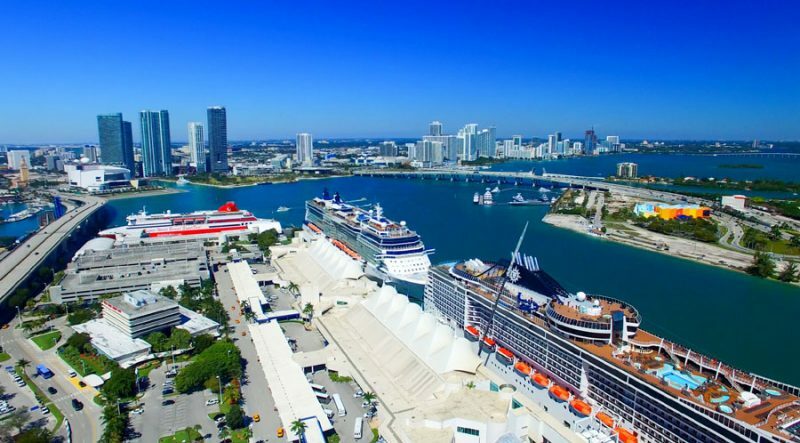 Several companies offer a convenient and efficient service for cruise parking and shuttle transfer to and from the Port of Miami. Safe Cruise Parking is located on SW 3rd Street, about 2.5 miles from the Port of Miami. It is fully regulated and costs $6.95 per day plus taxes and fees. Parking is in a secure gated lot and a fleet of complimentary shuttle buses transfer cruisers and their luggage right to the ship. The service includes luggage assistance. These shuttle buses depart every 15 minutes. Safe Cruise Parking also has onsite restrooms and refreshments. Pre-booking your Safe Cruise Parking is advisable. On arrival at the gate, you will need to hand over your reservation receipt/email before parking. Customers are given a yellow smiley face badge to wear so that drivers can easily identify their passengers for pick-up from the cruise terminal. Check these accessories before going on your cruise vacation. Miami Parking Lots operate from four different locations and offer convenient cruise parking in Miami along with free shuttle transfers. All lots have secure perimeter fencing, video security cameras and controlled access. While the nearest cruise parking lot is just three blocks from the port (within walking distance if you have minimum luggage) the furthest cruise parking lot is eight miles away. Prices are quoted according to the distance from the Port of Miami and range from $8 to $10.95 per day. It is advisable to book ahead of time and check which cruise parking lot your car will be on. During peak travel times, getting around Miami’s jammed highways and intersections can be very slow. Best Cruise Miami Parking offers a similar service for affordable cruise parking at $8.50 per day. It is less than 2 miles from the Port of Miami for a speedy transfer. Shuttle transport for up to four cruisers is included in the price of parking. If you are taking a longer cruise and want to keep your car out of the searing Florida sunshine, Premier Cruise Parking offers convenient cruise parking in a multi-story car park on NE 2nd Ave, less than two miles from the port. Prices start at $6.95 per night plus taxes and fees. You need to input your dates for an exact cost. Premier Cruise Parking includes a free continuous shuttle service to and from Miami Cruise Port. As this is a covered car park, there is a maximum clearance height of 6 feet 8 inches and oversize vehicles cannot be accommodated. At busy times, the garage operates a free valet parking service. Alternatively, Express Miami Cruise Parking (Garage) is just two miles from Miami Port and Cruise Terminal. It offers covered garage parking with 24/7 security and complimentary shuttle transport. The price per day is an unbeatable $4.95 per day. Check online for availability and book this bargain Miami cruise parking early. Many hotels in Miami offer Park and Sail Packages for Miami cruises. These can save you a fortune in cruise parking fees, especially if you have to stay overnight in Miami at the start or end of your Miami cruise. Some hotels include a shuttle service while others require you to take a short taxi ride. It’s worth comparing prices to see whether this could be the cheapest cruise parking in Miami. We have listed five of the most convenient hotels in Miami offering Parks and Sail car parking packages for cruisers. However, you can select any hotel in downtown Miami and ask about the cost of leaving your car on their lot for the duration of your cruise. It’s advisable to have your cruise parking arrangements confirmed before your arrival. Runway Inn 8 miles from the port, near Miami Airport. Rooms from $53 per night plus $10 per day parking. Total $123. Hyatt Place, Doral 9 miles from the Port of Miami. Look for special packages which may include up to 14 nights parking and a night in a luxury hotel for around $280. Hilton Garden Inn Miami is about 12 miles from Miami cruise port. However, its Park and Sail packages start at $129 for a one night stay and up to 7 nights parking. Quality Inn Miami Airport 12 miles from the cruise port. This 2-star hotel charges around $79 for a night’s stay with breakfast. Ask about their Cruise and Stay package deals which include transport to the port and cruise parking for up to 7 nights. 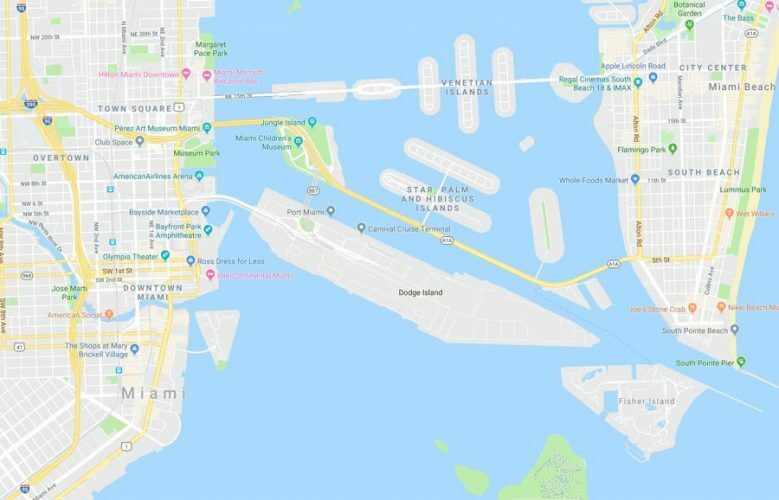 If you are driving to Miami and need convenient cruise parking, one of the best places to find secure parking is at Miami International Airport, just 7 miles from the Port of Miami. What’s more, most cruise lines run regular shuttle services between the airport and the cruise port so it pays to think outside the box. 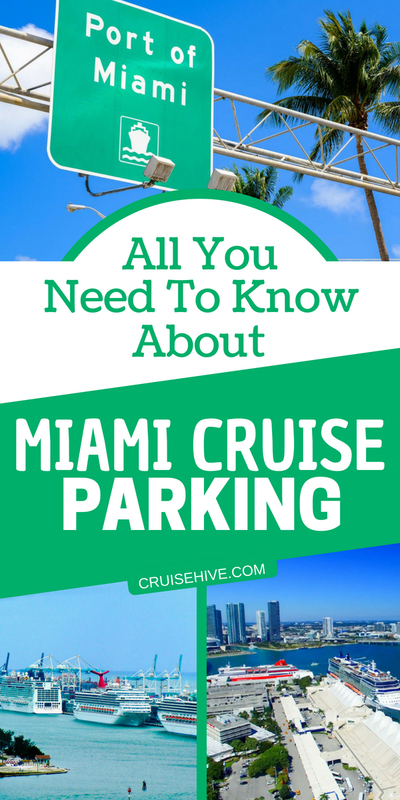 You don’t have to fly into Miami to make use of these cruise parking services! If you are driving to Miami from north/central Florida, or from out of state, use the I-95 S which runs down the east coast of Florida. You can also opt for the Florida Turnpike which is a quieter option with regular tolls. It runs for 340 miles from Ocala in North Central Florida to Miami before dividing. Ignore the Homestead Extension Florida Turnpike (HEFT) and join the I-95 at Golden Glades for the most direct route. Follow signs for the Port Miami Tunnel and continue to your designated Cruise Terminal. The Port of Miami currently has seven Cruise Terminals: B, C, D, E, F, G, and J. They are all located on North Cruise Boulevard, Miami FL 33132. Once at the port, follow the local signs to your cruise terminal or onsite cruise parking lot. Most hotels and cruise parking lots serving the Port of Miami have their own shuttle service. However, if you have parked at a hotel that does not offer a shuttle transfer, or you are using other parking options, you may need to organize your own private transport to the cruise terminal. Taxis are widely available from all over Miami, but they can be expensive. Taxi fares from the Port of Miami to Bay Harbor Islands, for example, (14 miles) can cost around $100 in slow traffic conditions. Express Shuttle could be a better solution. For one fixed price they offer share-ride services between the port, hotels and Miami Airport (where long-term parking can be found at affordable rates). If you are part of a larger group and need transport to your cruise parking, using a private shuttle van could work out cheaper and faster than paying a per-head fee for a shuttle bus. You can even book your own private shuttle van service to provide a shore-side Meet and Greet service. Call for a personal quote for this private transfer option to and from your cruise parking in Miami.